These are the stouts we can't do without. If you were locked in an underground box, had no calendar and couldn't see the sky, I'm pretty sure you could tell what time of year it was just by my beer selections. Like flipping a switch, the weather changed—and along with it, my hoppy and fruity palate. If you ask me, the timing couldn't have been better. There's a whole new batch of sticky, full-bodied beers to choose from now. As a result, I've found two new offerings from Epic Brewing Co. and 2 Row Brewing that you need to put on your lists ASAP. Epic Quadruple Barrel Big Bad Baptist: This is the fourth incarnation of Epic's popular Big Bad Baptist series of Imperial stouts. What made this brew so endearing to beer fans was its combination of exquisite coffees with oaky bourbon and rye. This version has all of those elements with the addition of rum barrels, roasted cocoa nibs, whiskey-aged coffee beans, whiskey-aged coconut and whiskey-aged almonds. The almonds are new to the series, and this is what helps separates this stout from its predecessors. Pitch black is the only color I see when I look at this ale. The head is a nice mocha color, with long, syrupy legs. The incredibly-layered nose features bourbon, coffee, vanilla and a hint of boozy rum. It's like marshmallow and nougat dipped in chocolate liqueur. The taste brings a lot more of the same layers—again with more bourbon, rum-soaked raisins, big cocoa and dark chocolate. The coffee layer comes next, with fudge and macchiato playing off whiskey and rum. The third layer brings in more-pronounced dark fruits, with hints of port wine and baking spices. The final layer is akin to silky cookie dough. I attribute this to the almond addition; it's such a contrast from the beginning layer and almost like adding cream to coffee. The finish lingers and sticks with an appropriate 11.5 percent amount of alcoholic warmth. Overall: I wouldn't have thought that almond would be such a powerful finishing flavor in a full-bodied animal such as this, but it really tames this complex beast of a beer nicely. 2 Row Raspberry Sticks: It looks like the holidays are here early at 2 Row Brewing. One of the state's best-kept secrets in craft beer has put together a stout that will re-create one of the favorite candies from the holidays: the raspberry stick. The small jelly-filled chocolate rods are a favorite of 2 Row's owner and brewmaster, Brian Coleman. "I really enjoy raspberry sticks and chocolate oranges around the holidays," Coleman says, "and have always wanted to duplicate those flavors in a stout." Well, Coleman has managed to faithfully replicate this famous holiday candy, and it's quite uncanny. It's black, as you can imagine, with a tan cap of foam on top. The aromas include the chocolate and raspberry blend up front, with just a hint of roasted malt in the background. The flavors are much as expected from the nose, but with chocolate up front and backed up strongly by the raspberries. Mingled in to the chocolatey flavor mix, tart and juicy raspberries emerge. The berries are nice and fresh tasting—an improvement versus the candy. The 8.3 percent alcohol is well concealed here, noticeable only from the slight warmth it creates after several sips. Overall, this is a very well-made beer that I'm really enjoying. My only criticism of this one is that it might not last until the holidays. This is the time for holiday beers; if you see them, buy them now. 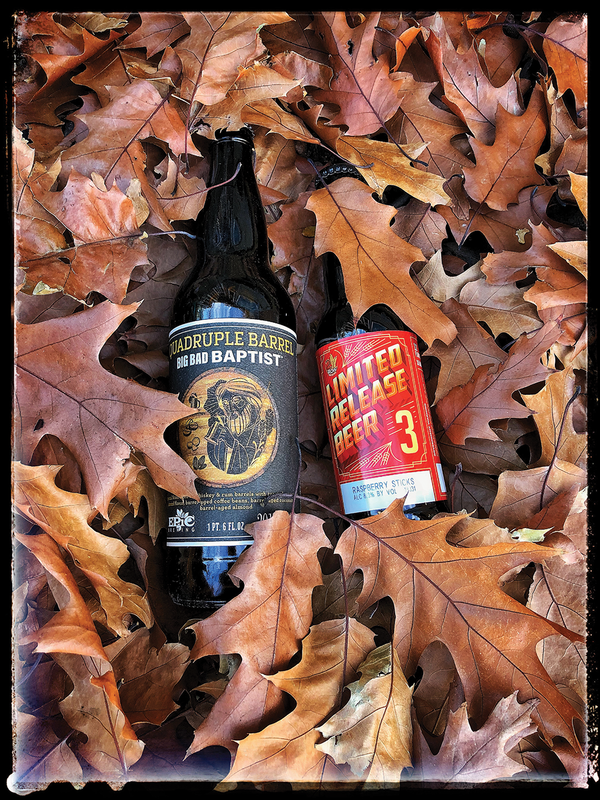 By the time Black Friday hits, the best of them might all be gone—and that goes for the hoppier holiday beers as well. As always, cheers!